Two years ago, then-teenager Auston Matthews, raised in Phoenix, AZ, was selected with the first overall pick in the NHL Draft. Two decades prior to that, Arizona had a total of three ice hockey rinks in the entire state. His success goes to show you don’t need ice to develop skills and find fun ways to learn hockey. 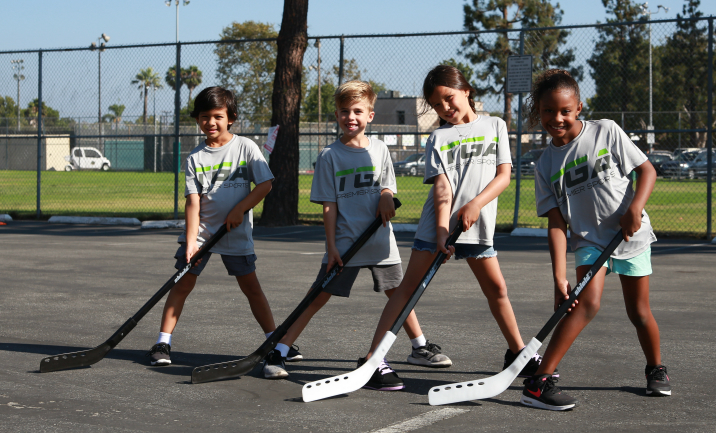 TGA Premier Sports has the knowledge and equipment to introduce the fun and exciting sport of floor hockey, no matter where you’re from. This modified version of ice hockey can be played in regular shoes on virtually any hard surface with a small ball and hockey sticks. Our programs maximize the fun by including an exciting mix of instruction, drills, and games to develop the fundamental floor hockey skills of dribbling, passing, shooting, defending and goal keeping. Safety is the number one priority so TGA’s coaches are extensively screened and trained to lead age-appropriate activities and enforce a no-contact rule. Just like the rest of our enrichment programs, we’ll bring floor hockey to you by offering it at your child’s school. Get started in hockey without all the expensive equipment and skates, but the same amount of fun 😉. Sign up for a program near you and get playing today!